Morris Leslie Vehicle Auctions’ 2nd classic of the year was a great success at the weekend, with 1500 people turning out to watch the action and bid on some fantastic classic lots. In an auction which spanned through the ages, with great entries from every decade from Modern Day back to the 1920s there were some tremendous prices achieved. 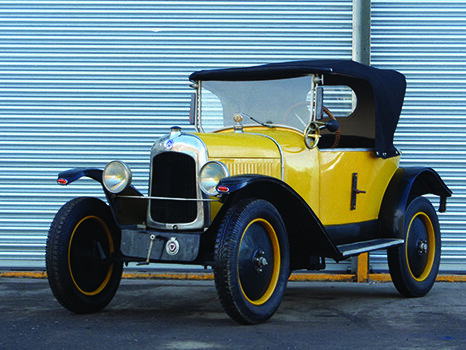 On a day that was full of energy and furious bidding from within the Auction Hall and across the Globe thanks to our online bidding facilities, one of the most fought over lots was that of a yellow 1923 Citroen Type C. The Citroen cleared its upper estimate of £5K and went for an impressive £9,844! The 1920s most be en vogue as from the same year, a fabulous 1923 Amilcar Type C4 Skiff sold at an impressive £26,500. Other notable purchases included a couple of classy Mercedes; a 2001 G Class and a 1989 420 SL both achieving over £20,000 and coming in at the high end of their guide price and for the truck lovers a 1955 Abion Claymore topped its estimate with a very respectable £12,296. On a day that had many interesting stories our favourite was the tale of the 1987 Ford Capri 1600 Laser. Its young buyer, Aaron, had a memorable reason to purchase this particular car as on his 16th birthday some years ago his Dad had bought this very car for him. At that time Aaron was unable to run the car and reluctantly had to sell it, he couldn’t believe his luck when the opportunity arose on Saturday to buy it back! See full results at https://www.morrisleslie.com/auctions/classic-cars/april-2018-classic-results/.